This apartment has everything you need for a great stay in Amsterdam, a fully equipped kitchen, 2 living rooms, 2 bathrooms and an amazing roof terrace. 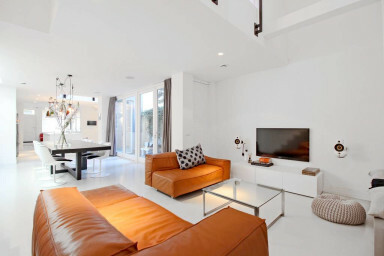 It is very unique to stay in such a luxurious family apartment in the City Centre and Jordaan neighborhood. Amsterdam's Jordaan is probably the most famous neighbourhood in the Netherlands. The Jordaan is nothing but highlights. Maze-like streets offer hidden courtyards, cafés (traditional but also trendy), art galleries and pleasantly noisy neighbours. One also has access to some of the more scenic outdoor markets in the country. In particular, Noordermarkt has a flea market on Monday mornings and an organic farmers' market on Saturdays. There are many more modern, trendy bars around Noordermarkt and along Westerstraat and Rozengracht. The side-streets that run south of Westerstraat have recently developed into a strong culinary district with some of the city’s more highly regarded restaurants. The best way to get around is by bike, because the most tourist venues are really close to the apartment. Otherwise you can use the bus 18 towards the city and back. Check in after 21:00 is possible but it costs an additional of 20,- euro.